Good. Make an example out of this unhinged demorat. 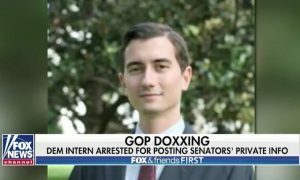 Jackson Cosko, who recently worked as an unpaid intern for Rep. Sheila Jackson Lee, D-Texas, was arrested for posting the personal information of Sens. Lindsey Graham, R-S.C., Mike Lee, R-Utah, and Orrin Hatch, R-Utah on Wikipedia — including their home addresses. Fox News learned Wednesday that Capitol Hill police are investigating additional doxxing incidents involving at least two senators, including Sen. Rand Paul, R-Ky. It was not clear if Cosko — who worked with other Democratic lawmakers including Sen. Dianne Feinstein, D-Calif., Sen. Maggie Hassan, D-N.H., and former Sen. Barbara Boxer, D-Calif. — was involved. Cosko had worked in a host of roles in the House and Senate, including as press assistant and legislative correspondent, according to his LinkedIn page. Former Utah Rep. Jason Chaffetz said on Fox News’ “America’s Newsroom” Thursday that the wide range of charges against Cosko, including witness tampering and burglary, suggests there could be more to the case than meets the eye. “With seven different charges out there, it really does makes it sound like it’s more sophisticated and widespread because now you see Sen. Rand Paul is also having issues,” he said, although he added that it wasn’t clear if Cosko was connected to the Paul case. While it was not clear what the motivation was behind the posting of personal information (known as “doxxing”), Graham, Lee and Hatch have been outspoken defenders of Supreme Court nominee Brett Kavanaugh amid sexual assault allegations against him. The doxxing on Thursday came moments after Graham had scorched Senate Democrats in a fiery speech for what he called “an unethical sham” in their treatment of Kavanaugh. The incident marks the latest in escalating attacks against Republican lawmakers and Trump administration officials — particularly in relation to the Kavanaugh controversy — by far left-wing activists, which have occasionally picked up the support of Democratic lawmakers. The tactic of hounding lawmakers and Trump officials out of restaurants became more prevalent in June, when White House Press Secretary Sarah Sanders and Homeland Security Secretary Kirstjen Nielsen were driven out of restaurants amid the backlash over the separation of illegal immigrant families at the border. That move was encouraged by Rep. Maxine Waters, D-Calif., who days later called on supporters to confront Trump officials in public spaces. “If you see anybody from that Cabinet in a restaurant, in a department store, at a gasoline station, you get out and you create a crowd and you push back on them and you tell them they’re not welcome anymore, anywhere,” she told a crowd. This week, Republicans have been pushing back against such tactics. Some have pointed to the shooting of Rep. Steve Scalise, R-La., at a Republican baseball practice last year as a reminder of how heated rhetoric can lead to much worse. The Daily Caller reported that Sen. David Perdue, R-Ga., and his wife were chased through Reagan National Airport by activists — who kept yelling at him even as he tried to use the bathroom. On the Senate floor on Wednesday, Perdue blamed Democrats for inciting such behavior, and read quotes he said were inciting harassment of Republicans in public. According to the Washington Examiner, Cosko could face 50 years in federal prison. “In 2014, Onfroy was sent to a youth detention center for a year on gun possession charges According to Onfroy, during his time in detention, the district attorney was attempting to try Onfroy as an adult for gun possession charges which, according to him, would have landed him 5-10 years in prison. Sick piece of garbage he is. From Daily Mail: A rapper has been condemned over his latest music video which shows him lynching a young white boy. XXXTentacion’s video for Look at Me shows him fitting a noose around the young blond-haired child’s neck and raising him off the ground on a stage. The child’s feet are seen twitching – a common phenomenon during hanging – before he goes limp. Elsewhere in the video, XXXTentacion, 19, appears hanging himself along with two other black men. The video also includes reenactments of the historic, racially-charged killings of Emmett Till and Philando Castile. The recent death of Heather Hyer, an anti-protester who was killed after being run over at an alt-right march in Charlottesville, Virginia, last month, was also depicted. The rapper claims the video decries racial violence across the board and says the lynching scene is a part of that. He insists he is trying to demonstrate what the lasting effects will be on the younger generation if the same violence continues. But critics slammed him for using a child to make his point with such ‘disturbing’ imagery. ‘I’m actually disturbed at the video of XXXTentacion featuring a young boy being hanged. This is beyond a joke,’ said one person. ‘Don’t make excuses for this sickness, simulated violence towards children is not cool or progressive. Not even to make a point. It’s dangerous,’ they said. ‘I have a huge problem with xxxtentacion and his new video. It doesn’t have anything to do with equality what so ever,’ another said. One person accused the rapper of inciting a ‘race war’. ‘If the RACIST POS xxxtentacion gets his race war, who do you think will be left standing?’ one person said. At the end of the video, the musician delivers a long message on racial violence and calls for it to come to an end for the sake of younger generations. ‘Equity and equality. The end result we all, the ones that don’t want to live in misery, desire. The youth is never inspired to make a stand to make a difference so I will speak for them. Are you willing to risk your child’s future due to your own bigotry? The choice is yours but your child will not stand for the hate. This generation will be loved, nurtured, heard and understood,’ he said. Some viewers appreciated the video and sided with him. ‘If you can’t comprehend what xxxtentacion meant with the look at me video maybe you’re just too stupid,’ said one. ‘He was simply trying to show how the next generation would be affected if race wars went on,’ another said. XXXTentacion’s real name is Jahseh Onfrey. Earlier this week, he responded to domestic violence allegations in a series of profane-laced videos. He was charged with aggravated battery of a pregnant woman, domestic battery by strangulation, false imprisonment, and witness-tampering. In the clips, the rapper denied the charges and accused critics of plotting against his success, and threatened to ‘fk ya’ll little sisters in their throats’. It’s unclear what the relationship was between the woman and XXXTentacion.